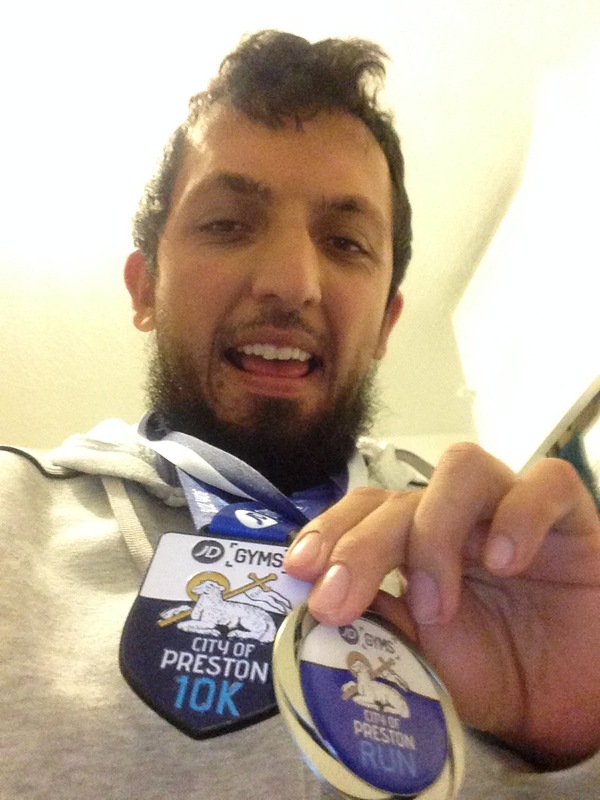 On Sunday 30th September, I did the 10 K and family run in my home city of Preston. Race days are always brilliant. The, camaraderie is great, that atmosphere tends to be awesome, you meet lots of new people and for most of runners you have fun. However this was made even better due to the fact that it was a local race. The 10 K and family one miler is an annual event that happens once a year it’s nice to have an event on that a lot of people can’t participate in. The Red Rose team gathered in the middle of Preston town centre for the customary team photo and after a bit of socialising it was time to head over to the start. The great thing about running is they bring so many people together from different parts of the country and different walks of life. At the start line I saw Keely who I know from Twitter and who I briefly met at Manchester marathon earlier this year. It was quite a surprise as I only found out through Twitter the previous night that she was planning to do it so it was nice to see her. The rest started and I was being paced by the legendary John Wiseman to try and get a sub 50. The race started in Preston town centre, then headed down towards Avenham Park, down London Road, past the capital Centre, back into the park where there was two monster hills on miles 4-5. I was still running with John and I realised the sub 50 wasn’t happening but as I made my way through the park again and of towards the city centre, I felt great because that was the best I have run over that distance in a long while. Last weekend, I felt a little dejected when I finished Loch Ness marathon due to the time I got but that day I felt amazing. Thats the thing with running. That will be great runs and lots of great ones. The greater on top of that make it worth it. Thanks so much. Race for life is great and I’m glad your happy that you finished it. Thanks so much. I was well surprised to see her! Congrats on such an amazing achievement, you did so damn well lovely!! I’d love to sign up to do a run like this but I’m currently struggling to get my 5K time under 30 minutes and then I’m going to start pushing myself to do longer distances so maybe next year! Congratulations on finishing the race and having such a good run! Thanks so much. 30 mins is still a great time for a 5k. Hope the long distances go well for you! Well done on a great run! Running 10k sounds quite difficult to me, although the last run I have done was a colour rush run which was 5k although I struggled – not used to running haha. Glad you enjoyed the Preston 10k! That’s sounds like a fabulous run and even better that it was at home! Time doesn’t matter when you’re enjoying – I think we become a slave to timings etc my best runs have been when I have just enjoyed it. Thanks Nina. I agree. Some of the most enjoyable runs come when I’m taking it easy. It must have been really fun to run on local roads you’ve always walked! Awesome job on running the 10K, and although you didn’t get a sub 50 at least you felt strong throughout the run – that’s the most important thing! Wow congratulations on completing a 10K, that’s absolutely incredible, I wouldn’t be able to manage one haha! I love that you enjoy the whole atmosphere, it sounds like a really enjoyable day! Amazing achievement Faisal! I’m also a runner and ran a half marathon around the same time as your 10k. A sub-50 would be a dream come true for me! Looking forward to seeing more of your running posts! I always admire people that do marathons so much. I wouldn’t be able to do one! I’m so happy you enjoy it, and it’s such a cool way to meet people too like you said! Congratulations! That’s an amazing accomplishment!